5 Adjustable DPI Switch: 4000, 2750, 1750, 1250, 750, control your own speed freely. DPI shift gear with variable speed lighting instructions, to bring you a super high gaming experience. High quality,durable material: Using 1.8 M 5 core pure copper wire with high-strength braided fiber Outside and USB gold-plated head. Anti interference weaving cable for prevent accidental pulling injury mouse and greatest durability. 5 core pure copper wire and USB gold-plated head make sure the transmission signal is accurate and fast and USB head durability. It’s very suitable for professional gamers. Wide compatibility and easy to use：Compatible with Windows XP, Vista, Windows 7, ME, 2000 and Mac OS…or latest. No need any driver, plug and play directly. Amenable to trial: Using high anwar A3050 core,e-sports micro level up to 20 million times. 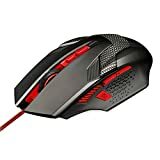 Lsea&M Brand New Gaming Mice USB Wired Optical 4000 DPI Mouse with RGB Illumination. 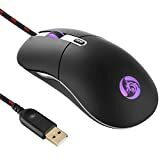 Ergonomic high frequency Optical Gaming Mouse with 6ft high-strength braided fiber cable, anti-skid scroll wheel, and purple backlight. With 6 Keys, including Left button, right button, Scroll Wheel,Left and right side buttons and DPI switch button for easy Internet Surfing. The DPI Button behind the Roller has 5 steps, default is 750/1250/1750/2750/4000, and the maximum range is 4000DP. Using 1.8 M 5 core pure copper wire and copper braided wire .Anti interference weaving cable for prevent accidental pulling injury mouse and greatest durability and signal accuracy. Durable smooth TEFLON feet pads and contour body for ultimate gaming control. High-end features including 6 buttons, DPI can be switched freely, breathing light in gorgeous cool purple for an incredible user experience. 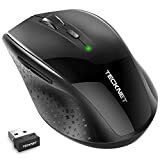 Perfect Hand Feel: Gaming mouse perfectly snugly fit under your palm; the ergonomic shape of the mouse gives gamers the most comfortable gaming experience ever, especially during the most testing of battles. Using high anwar A3050 core, e-sports micro level up to 20 million times.